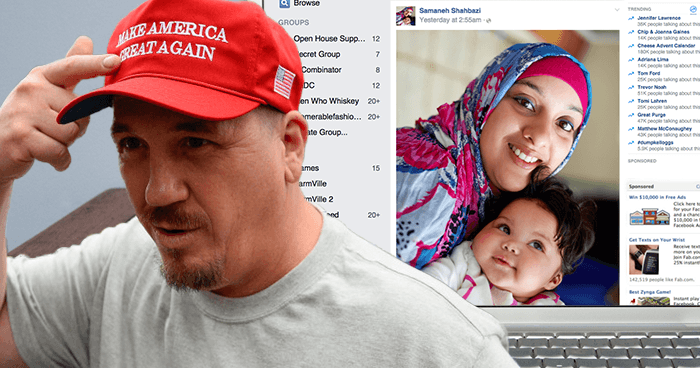 Howell, Michigan resident Quentin Branscomb actively defended his choice to wear a Make America Great Again hat early this week by aggressively attacking a woman on Facebook for wearing her hijab. Branscomb, who was reportedly awake at 3 AM this past Tuesday due to a combination of Red Bull, dip, and Halo 5, found the profile of a woman he has never met before on a community page he follows. The night took a fateful turn when Branscomb – who has not removed his hat in eleven months save for sleep and showering – noticed that the woman was wearing a hijab in her profile picture. Branscomb, who moved to Howell two years ago and has reportedly not yet attended the tree lighting, had a lot to say about Shahbazi’s decision to wear a hijab. “It makes me angry that these people living in our country can’t see that they’ve been completely brainwashed by an extremist doctrine,” Branscomb said, while scratching the flakes of dandruff that have accumulated under his Donald Trump hat due to lack of scalp stimulation.